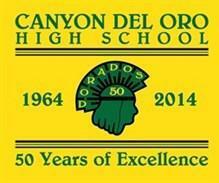 Canyon del Oro High School is called as CDO by most students and Oro Valley families. Canyon del Oro High School is one of 3 high schools in the Amphitheater School District. The Canyon del Oro High School facilities are on West Calle Concordia Road just west of Oracle Road in the Town of Oro Valley AZ. CDO was established in 1964 and has about 1,600 students attending grades 9 through 12. In addition to its highly ranked academic programs. Canyon del Oro High School has also produced a number of baseball players in the Major League. CDO is one of the highest ranking schools in Arizona in academics and sports. Newsweek has ranked Canyon del Oro High School in the top 5% of U.S. Public Schools for 3 times since 2007. During the 10 year period from 2000 to 2010, CDO graduated 42National Merit Scholarship Semifinalists. While this may border on TMI (to much information) the school name Canyon del Oro comes for the Spanish language and means Canyon of Gold. During the mid 1800, gold had been discovered in the area now called Oro Valley. At the time, it was rumored that gold could be found in large quantities in and around the Santa Catalina Mountains. These rumors were further fueled by the legend of the lost Iron Door Gold Mine. The history of the mine goes back to 1767 when the Jesuits were expelled and left behind their riches. Bars of gold were said to have been hidden behind an “iron door.” Thus, the legend of Mine with the Iron Door was created. Many prospectors of the 1880’s hiked the Catalina Mountains and the area now know as the Canada del Oro Wash bed in pursuit of their fortunes. Considering Oro Valley AZ as a place to live OR considering a future retirement place to call home? We can help!